The Shanghai Jiading World Foreign Language School, a new private school located in Nanxiang town, Jiading district of Shanghai, is set to complete its construction on August this year. The campus, situated on an area of 37,902 square meters, comprises of six main buildings for teaching, labs, library, administrative affairs, indoor stadium, and others. The six buildings will be in an "L" shape and their second floors will be connected by corridors. The campus focuses on going green and its greenery coverage rate will reach 35 percent, while all the six buildings have conducted greening on the roofs, according to the project manager. The new school, including a primary and a middle school, aims to help balance local educational resources, improve the quality of local education, and satisfy the education needs of the local people. 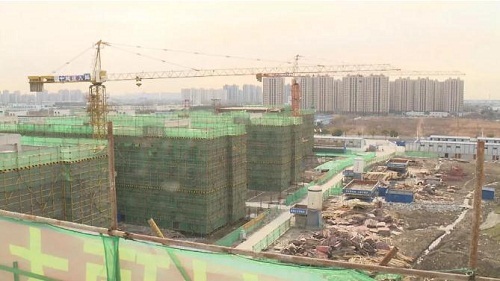 Although the construction of its new campus hasn't yet been completed, the school has started the enrollment of two six-grade classes of 70 students and rented several classrooms of the Jiading campus of a high school affiliated to Shanghai Jiao Tong University. After the completion of its new campus, the school will have 40 classes, housing more than 1,000 students. The school that started construction in 2015 is a joint effort of Jiading district and JuneYao Group, a Shanghai-based conglomerate. Founded in 1991, JuneYao Group is involved in the education, food and high technology sectors, and is also the parent company of JuneYao Airlines. JuneYao took over the private Shanghai World Foreign Language Middle School in 2005. It is a college-preparatory school that offers the International Baccalaureate (IB) program. In 2013, the company set up the first World Foreign Language School outside Shanghai, in Gongshu district of Hangzhou, Zhejiang province. According to local officials, the establishment of the foreign language school will improve the overall educational level of Jiading and attract more talent to work and settle in the district.